This article will be about the type of ‘smart’ meter system now being installed by Detroit Edison which uses a ‘mesh network’. 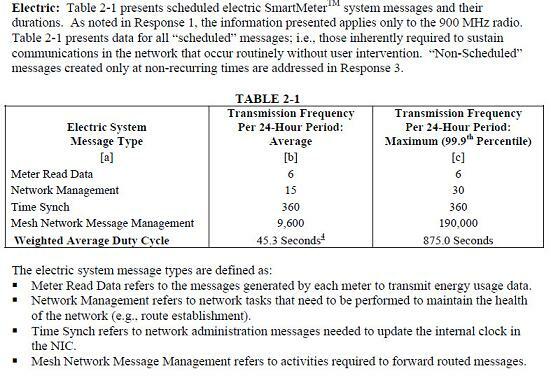 Under this approach your ‘smart’ meter, in most cases, is not transmitting its information directly to a receiver on the utility pole. Rather it is sending its information to your neighbor’s meter, who in turn sends it to another neighbor’s meter and so on, until the information reaches a ‘collector meter’ somewhere down the block which beams it up to a receiver on the utility pole. Multiple routes are possible between all these meters so that if one route fails the network will automatically re-route the information by another path. For this reason such networks are often described as ‘self-healing’. One thing to understand about such networks is that the total number of radio frequency (RF) pulses that must be transmitted by or through any given meter is far greater than the number of pulses that would be needed just to send the data from that one meter up to a receiver on the pole. For each meter acts as a relay point for quite a number of other meters in the neighborhood. Utilities often make statements that they are transmitting readings, for example, “only six times per day”, or they will say that the total RF transmissions only amount to 45 seconds per day. In its recent response filed with the Michigan Public Utility Commission, Detroit Edison stated that, in the average case, transmissions only amounted to 53 seconds, and in the extreme case would not amount to more than 497 seconds. Now that does not sound like much does it? What they neglect to explain is that there are actually micro burst peaks being transmitted every few seconds 24/7/365. Each such micro burst may be only a few microseconds in duration. They get the figures of 53 seconds and 497 seconds by adding together all these tiny spikes. But the effect on the human body is determined by the intensity of those spikes and by the relentless nature of those spikes. What the above data shows is that the number of messages (and RF spikes) needed to operate the system is far far beyond anything that might be expected based on how often an individual meter transmits its readings. In fact simple math will reveal that, in the average case an RF pulse must be broadcast about once every 6 seconds all day long. In the maximum case there will be about 2 RF spikes per second. Each spike is high intensity, and it is the constant battering of the human nervous system by such spikes all day long, and the absence of any respite even while sleeping, which creates the mischief. It is our understanding that the system Consumers Energy plans to deploy, on the west side of the state, is not a ‘mesh network.’ If that proves to be the case at time of actual deployment next August, then the amount of RF traffic in that utility’s network should be much reduced1 – for each meter then would only have to transmit its own information to a receiver. 1 (Rev 04/27/12) It has been brought to my attention that Consumers has not released detailed information about the layout of its new system, so that it may be premature to speculate that its system will be less harmful than DTE’s mesh system. Also the vendor originally selected by Consumers to implement their new system has recently been acquired by Itron, the company which manufactures all the components in DTE’s mesh network system – so that it remains uncertain which type of system Consumers will finally choose.